Kreteks, often referred as clove cigarettes, are Indonesian cigarettes made from a complex mixture of tobacco, clove and aromatic "sauce." 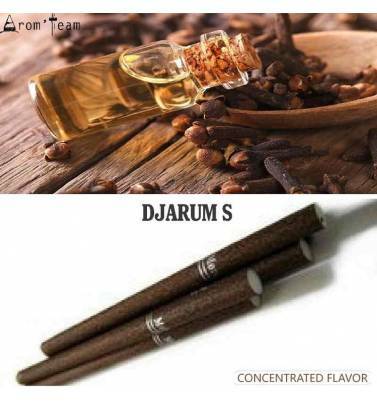 * Arom-Team review: a very aromatic tobacco flavor that absolutely requires a long maturation time to reveal its subtlety. This flavor contains tobacco absolute and extract and will make a cheap juice for electronic cigarette but a high quality e liquid. * We recommend a respected dosage and a long maturation time for this range. How to dose this djarum tobacco flavoring ? What's the steeping time to make a kretek e-liquid ? Tobacco aromas require a fairly long maturation time. Give this flavor a 4 to 6 weeks steep.